For this year’s Breast Cancer Awareness Month, celebrities such has Serena Williams have worked to raise awareness and encourage women to go for regular check-ups. The reason behind such campaigns is simple: The earlier cancer is diagnosed, the less likely it is to spread to other parts of the body and the more chance the patient has of survival. In fact, survival rates have been rising steadily over the past decade. 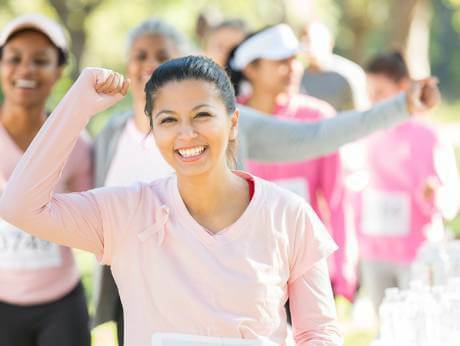 “Due to the better diagnosis and staging, the treatment of breast cancer has improved and survival rates for stages 0, 1 and 2 of breast cancer have increased from 80 per cent to 97 per cent,” says Dr Keya Rahul Shivadey, Specialist in Obstetrics and Gynaecology, Aster Clinic. As the medical profession’s understanding of breast cancer has evolved so has the way the disease is treated. 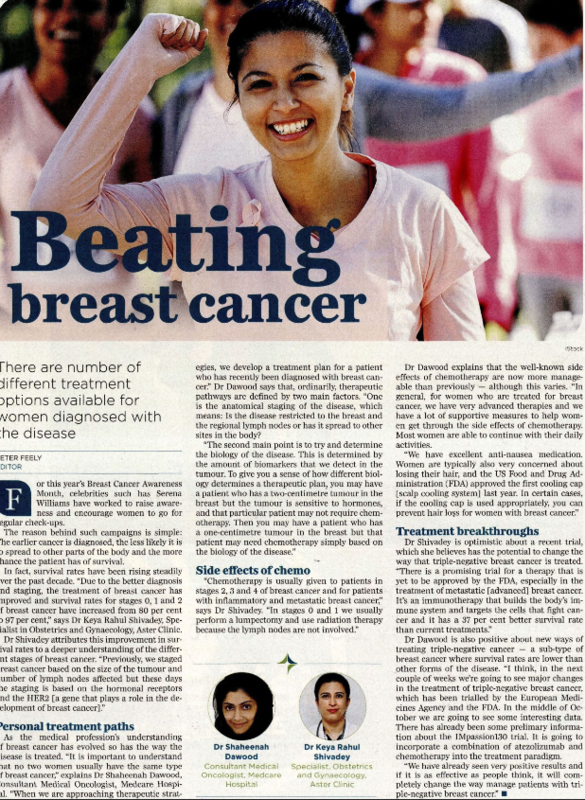 “It is important to understand that no two women usually have the same type of breast cancer,” explains Dr Shaheenah Dawood, Consultant Medical Oncologist, Medcare Hospital. “When we are approaching therapeutic strategies, we develop a treatment plan for a patient who has recently been diagnosed with breast cancer.” Dr Dawood says that, ordinarily, therapeutic pathways are defined by two main factors. “One is the anatomical staging of the disease, which means: Is the disease restricted to the breast and the regional lymph nodes or has it spread to other sites in the body? Dr Dawood explains that the well-known side effects of chemotherapy are now more manageable than previously — although this varies. “In general, for women who are treated for breast cancer, we have very advanced therapies and we have a lot of supportive measures to help women get through the side effects of chemotherapy. Most women are able to continue with their daily activities. Dr Dawood is also positive about new ways of treating triple-negative cancer — a sub-type of breast cancer where survival rates are lower than other forms of the disease. “I think, in the next couple of weeks we’re going to see major changes in the treatment of triple-negative breast cancer, which has been trialled by the European Medicines Agency and the FDA. In the middle of October we are going to see some interesting data. There has already been some prelimary information about the IMpassion130 trial. It is going to incorporate a combination of atezolizumab and chemotherapy into the treatment paradigm.